A short walk from Chandni Chowk down the oddly-named Esplanade Road brings you to Old Delhi’s (or Shahjahanabad’s) famous Jama Masjid. Dense and narrow bazaars, similar to ours at Anarkali, fill the long vanished canal that once bisected a tree-lined esplanade (or walkway) in front of the nearby Red Fort. You cannot fail to be distracted by shops peddling jewellery, perfumes, spices, brocades, silks, Quranic CDs, and even coffin shrouds and funerary accoutrements. A bit of each for the ‘here’ and the ‘hereafter’, so to speak. In a few minutes, you find yourself against an impressive stairway platform that leads up to the mosque’s main (eastern) portal. The mosque is sited on what was once a small hillock so it could offer a magnificent view from afar, but now the congested localities barely allow a minaret to peek through. As one looks around after entering through the main portal, the ubiquitous sub-continental tout emerges to help you with the history of the mosque, “in a language of your choice, sahib.” Sooner he is shooed off, a greedy-looking man in kurta-pyjamas complete with a grease-trimmed Nehru cap introduces himself as being from the mosque management, and announces the ‘official’ rates for using your own camera: Rs 25 for stills and Rs 75 for videos. “The scores of foreigners milling around have been charged more,” he whispers, “for they are not our Musalman biradaran.” Half-pleased to be of the chosen people, I and my wife enter the courtyard to peruse India’s largest mosque commissioned by the definitive aesthete, Mughal Emperor Shah Jahan. Quite unlike anything we had seen at our Badshahi Masjid in Lahore, we noted with some astonishment, a sizeable community of squatters, hippies and tired tourists sprawling in the colonnaded galleries adjacent to the courtyard. The courtyard itself gave a rather unkempt look, what with durries and reed mats scattered shabbily. Tangles of electric wires hanging between chandeliers, loudspeakers and junction boxes were equally unsightly and, reflected poorly on the mosque management, ie the Waqf Board which is constituted under the government’s Waqf Department. It may be noted that the Archaeological Survey of India, on the other hand, has done a good job in care and maintenance of historical sites in Delhi, most of which hark back to the Islamic era. 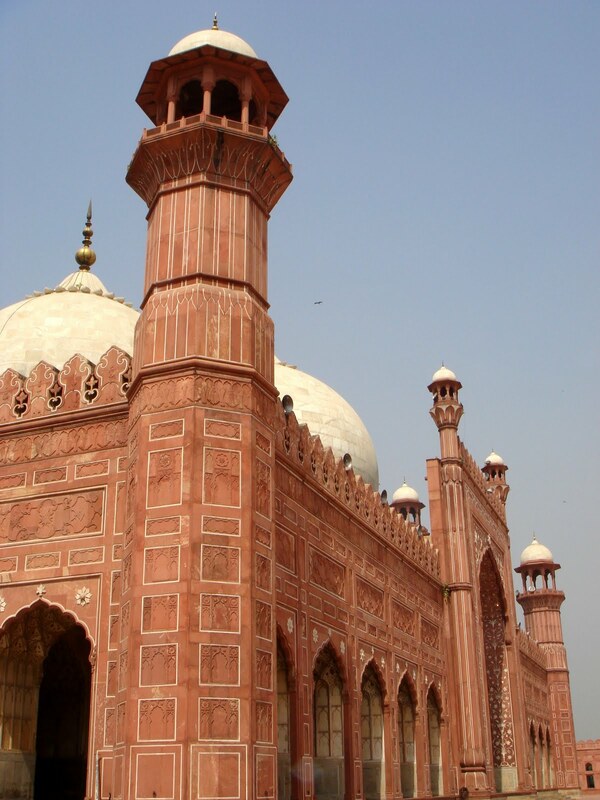 The structure of the Jama Masjid is eye-catching indeed and at first glance, one notes the pinkish hue of its sandstone compared to the more ruddy appearance of the Lahore mosque. The Jama Masjid is archetypal of the Mughal mosques, with a lofty main portal, huge courtyard, tall minarets, a prayer hall capped by three domes girdled by minor kiosks and, a well-embellished arched main entrance flanked by numerous smaller ones. The Jama Masjid’s main entrance to the prayer hall is, however, disproportionately large and obscures three-quarters of the central dome when viewed from the main portal across the courtyard. The Badshahi Masjid suffers from a similar imperfection, though not as gross. Only the main entrance of the Taj Mahal seems to have got the proportions right with respect to the central dome, as both elements can be seen complementing each other, like a perfect ensemble. 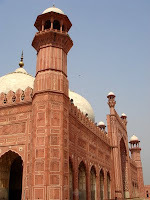 Unlike the Badshahi Masjid, which has four tall minarets at the corners of the courtyard and another four short ones at the corners of the prayer hall, the Jama Masjid has only two minarets at the front corners of the prayer hall; four squat bastions or burj with Rajput style chhatris and arched pavilions dot the courtyard corners. The courtyard of Badshahi Masjid is over two-and-a-half times larger than that of Jama Masjid, so the scheme and number of minarets seem eminently suited to the respective dimensions of the two mosques. The white marble domes of Jama Masjid have thin black stripes, which make them look more natural and organic, if you will: Emperor Babar’s much-loved musk melons would not be a wholly inapt description, I thought! White inlaid stripes are also echoed in the two minarets, emphasising verticality whilst subtly alleviating the monotony of red sandstone. As we walked towards the prayer hall, we looked through the arched colonnades and spotted the Red Fort in the distance, with its main Lahore Gate beckoning us Lahoris for a visit which was undertaken shortly afterwards. 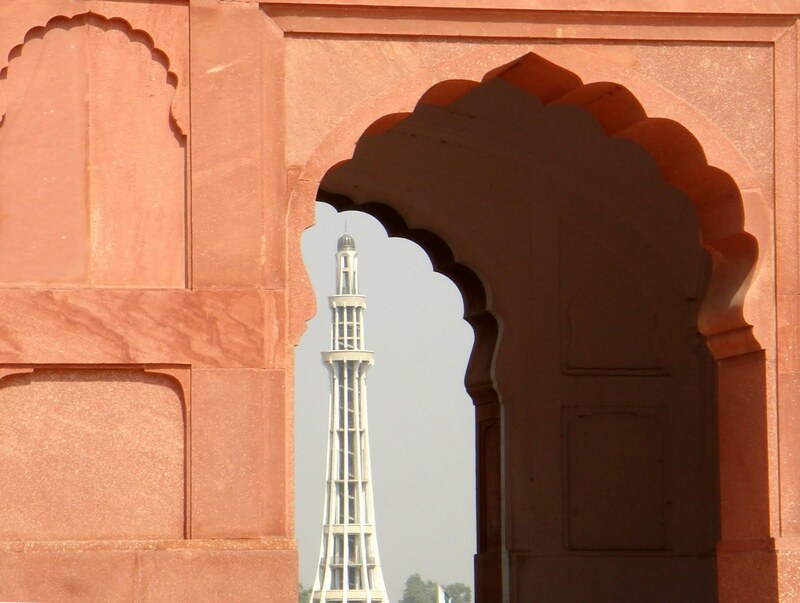 While we are at arches, I am reminded of an impressive view from one of Badshahi Masjid’s colonnade arches, which frames the Minar-i-Pakistan like a lighthouse in a sea of Sunday revellers. A badge typifying the Islamic Republic of Pakistan could not come out better. The Jama Masjid’s prayer hall is slightly smaller than that of Badshahi Masjid but is equally imposing, and is richly embellished. White marble inlay (pietra dura) exquisitely decorates the red sandstone outer walls, while stucco work, flowing arabesques and bright floral themes on inner walls and ceiling, leave no doubt about the supremely refined artisanship under Mughal administration. Akbar’s grand mosque at Fatehpur Sikri (completed 1572 AD) has served as the basis for the design of Shah Jahan’s Jama Masjid (completed 1656 AD) while in turn, Aurangzeb’s Badshahi Masjid (completed 1674 AD) is well-rooted in the Jama Masjid’s design. We saw no harm in architectural ideas being creatively shared within the Mughal family! The Jama Masjid environs are regrettably quite messy, with no green areas, no worthwhile car parking and, plenty of rubbish that keeps none but the omnipresent kites and crows in good cheer. An ambitious municipal plan to beautify the place has not quite taken off, though it promises to restore some glory to this otherwise remarkable mosque. The Badshahi Masjid has done much better on this account, with better overall cleanliness, at least in the immediate vicinity. The well-maintained Hazuri Bagh provides a comforting welcome to the visitors, though the cold drinks kiosks and ice cream freezers lining the garden perimeter do their bit to blight the scene. A little afar, the comprehensively potholed parking lot that precedes the Roshnai Gate is a makeshift affair and, being unpaved, remains practically a dust heap. Razor wires and the senselessly placed star barriers (now, akin to national symbols in Pakistan) pay lip service to security, without regard for busloads of sightseeing schoolchildren who have to fend for themselves around these atrocious barricades. It is gratifying to see the two famous Mughal mosques still fully functional and, in a reasonably good state of repair. Multi-religious India sees the continued glory of Jama Masjid as an affirmation of its secular ideals, while Pakistan showcases its Badshahi Masjid as a perfect manifestation of its Islamic heritage. Emperors Shah Jahan and Aurangzeb had, on the other hand, sought to display imperial splendour wrapped in innocuous layers of faith and piety – an effort that served its purpose well. Today, quite the other way round, the devout find it intensely satisfying to seek faith and piety under harmless imperial splendour. Who knows, the excesses committed by the emperors might pale in the shadows of the two glorious mosques, for they continue to echo His name three-and-a-half centuries later. This article was published in the daily newspaper The News International on 3 April 2011.